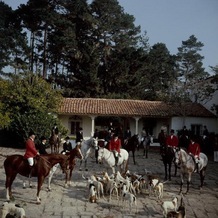 Riders gather in the courtyard of Richard Collins' House for the stirrup cup libation, before the start of the Pebble Beach Hunt of English and American foxhounds, November 1976. The four red-coated riders are (left to right) whip Janet Ellis, joint master John Love, president of the US Pony Club, huntsman Patrick Ellis and joint master Richard Collins. Copyright Getty Images.